The Homeland Security Department is making some progress in fulfilling President Trump’s mandated hiring spree, according to a year-end report, but is still failing to bring on more border agents than it loses through attrition. Customs and Border Protection hired a total of 1,477 frontline personnel in fiscal 2017, the agency announced on Tuesday, a 14 percent increase over the number it brought on the previous year. Most of those hires were for CBP officer positions, which saw a 21 percent spike in new people. Trump’s request for 5,000 new CBP employees, however, focused on Border Patrol agents. The agency saw just a 4 percent increase in new employees for those positions. While the numbers demonstrate some progress at CBP, which has for years struggled to keep pace with a congressionally mandated floor of employees, they reflect only new hires without accounting for net losses. Ronald Vitiello, CBP’s acting deputy commissioner, said even the increased hiring in fiscal 2017 has failed to keep pace with the losses sustained at the agency. Vitiello said changes in testing and investment in support staff have led to improvements. "We have more people in the pipeline and they are doing better in getting through the hiring process,” he said. In September, the House approved a fiscal 2018 spending bill that would provide $100 million for the Border Patrol to hire 500 new agents and $186.5 million for Immigration and Customs Enforcement to boost its ranks by 1,000 officers next year. It also backed the 2017 Border Security for America Act (H.R. 3548), which would authorize CBP to hire 5,000 new Border Patrol agents and an additional 5,000 customs officers. The former mandate is one Trump required through executive order in January. Trump’s executive order did not address customs officers. A Senate appropriations bill did not provide funding for any new hires for the customs positions, nor did it propose any spending for new ICE agents. ICE acting Director Thomas Homan reiterated on Tuesday the agency’s need for the 10,000 new agents Trump has mandated. He said ICE would need more resources, including both personnel and detention beds, to continue to make progress on Trump’s campaign promise to rid the country of all undocumented immigrants. Homan and other administration officials touted the progress they have made on that front already. ICE removed more than 81,000 individuals as a result of arrests from Jan. 20 through Sept. 30, a 25 percent increase from the same period in fiscal 2016. Overall ICE removals were down 6 percent in the fiscal year since Trump took office, but that was due to a dramatic decline in border deportations. The ratio of removals resulting from ICE arrests increased from 27 percent to 36 percent. 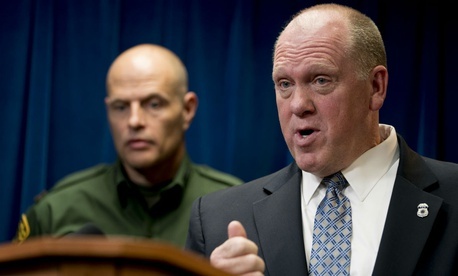 “ICE is hitting on all cylinders,” Homan said. He attributed the boosted figures to new policies under Trump that enable his agents to remove any undocumented immigrant for any reason, rather than just those who have committed serious violent crimes. ICE arrested 143,000 individuals for violating immigration laws in fiscal 2017, up 30 percent from the previous year. In the time since Trump took office compared to the same period in 2016, arrests jumped 42 percent. About 11 percent of immigrants ICE arrested had no known criminal charges or convictions, while an additional 16 percent were facing pending charges but had not yet been convicted. The Border Patrol apprehended 311,000 individuals in fiscal 2017 and CBP officers rejected 216,000 inadmissible cases, totalling nearly a 24 percent decline from the previous year. To justify the ongoing need for more agents and Trump’s proposed wall along segments of the U.S.-Mexico border, CBP noted an uptick in the second half of the fiscal year in family-unit and unaccompanied children apprehensions. The agency also cited its ongoing work preventing gang and drug-trafficking activity. Assaults against CBP law enforcement personnel spiked to 847 incidents in fiscal 2017, a 45 percent increase. Vitiello could not offer an explanation for the increase. CBP’s use of force incidents dropped by 23 percent to 459, which Vitiello attributed to the use of review boards and enhanced training.